I don't know if I fully understood or appreciated what my mum did for me growing up or what she sacrificed so that I could do the things I wanted to do, but since having children myself, I've really come to comprehend what she's done for me and how she's supported me through the years. Though living on different continents for the last nine years or so and being busy with our own lives I'm really lucky to know I can always count on her. My mum and grandma are super talented and creative women and I owe all my crafting, sewing and cooking knowledge to them. My mum is an amazing artist and she illustrated the mouse on a toadstool in the above picture, along with a series of other children's paintings for the kids' room. I wish I had even a fraction of my mum's ability to draw and paint, but I can barely draw stick figures. My daughter, Isla, however is a budding artist and frequently tells us she wants to be an artist, like grandma, when she goes up. I have very found memories of watching my grandma at her sewing machine when I was little. She always had a project going and would frequently be making things for friends, neighbours, the hair dresser, you name it and they would get a quillow or bunny, like the one in the photo, which she made me when I was little. 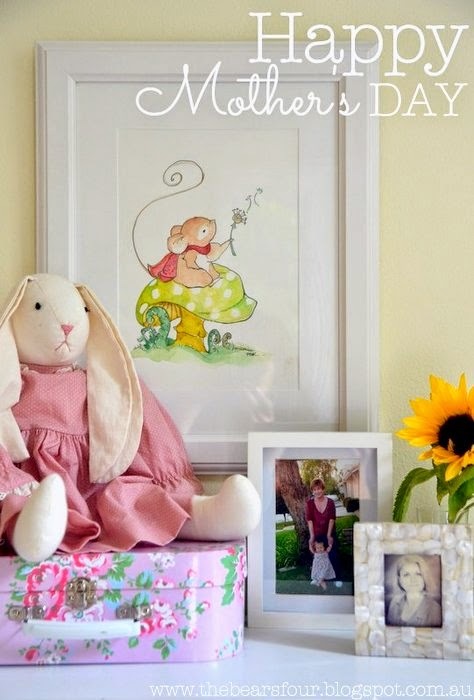 I treasure that bunny, even though its dress has lost its elastic and its mouth is a bit more downturn after years of being played with, it reminds me of how much she loves me because I know what it's like to want to make something special for your kids and see their faces light up when you give it to them. So I want to thank my mum and grandma for their love, support and inspiration to create.